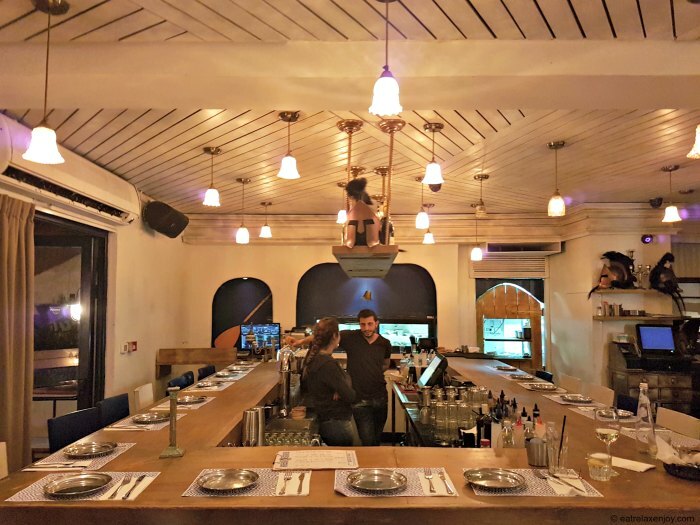 Sparta is a Greek bar-restaurant in Tel Aviv with a wide alcohol menu, great atmosphere and excellent, non expensive, Greek food. With an ‘all you can drink’ Alcohol deal and happy Greek music you can have an authentic cheerful Greek evening! Sparta’s décor is simple and ‘Spartan’ with a lot of wood and blue color. 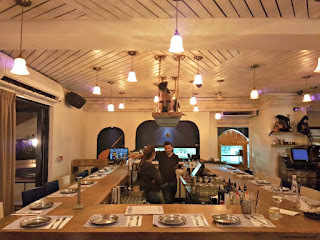 It is organized in two levels – indoors and outdoors, with many seats on the bar. Outside, it is shaded with blue shades that bring the sky and the sea into the restaurant. Sparta’s décor includes Greek artifacts and plenty of Alcohol bottles; together with the cheerful Greek music (which is quite loud) it feels like a little celebration. The Alcohol menu will invite you to celebrate – there’s an ‘All you can drink’ deal for 98 NIS per person including all the house beverages, such as beer, wine, vodka, Whisky, Campari, tequila and more. The atmosphere here is very joyful, with all the alcohol and good food. The menu is very Greek although it has some Middle Eastern touch. It is inexpensive and varied, although you won’t find every Greek dish. The food is served on stainless steel plates in the spirit of Sparta, but the food is far from being Spartan – it is more like a celebration. So what did we eat? 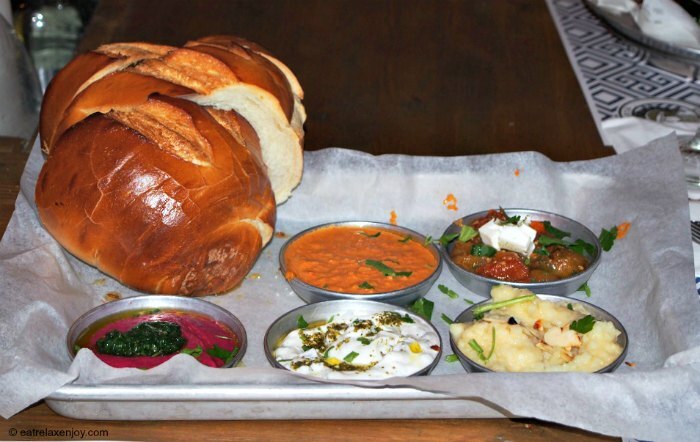 Greek Mezethes – 5 signature mezethes served with bread (59 NIS). This included Tzatziki, roasted peppers and yoghurt salsa, tomato confit, and Skordalia, served with a quarter loaf of soft-warm bread slightly burnt on the fire. All the mezethes were good, and I kept some of the Tzatziki for the fish. 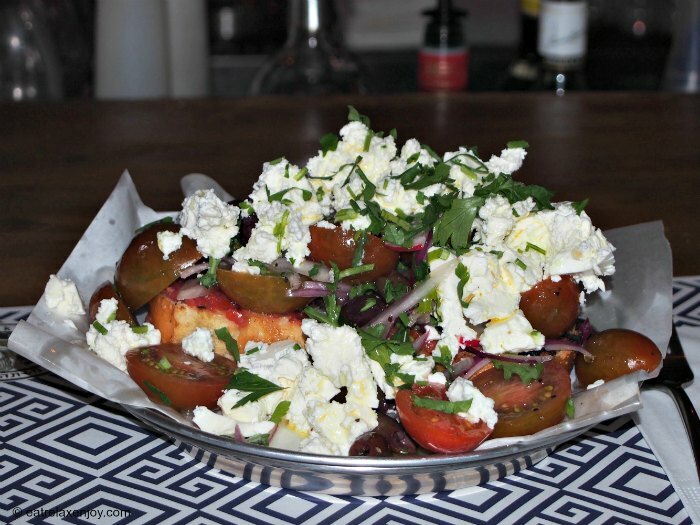 Dakos – Bruschetta with freshly chopped tomato salad, purple onion, olive oil, Kalamata olives and grated Feta cheese (32 NIS). An excellent salad! All the ingredients in this salad were superb – starting with juicy Tiger tomatoes, all the way to the firm Kalamata olives and the delicious cheese. All this was laid on a think white burnt bread (only the top was burnt, the inside was soft) with a layer of tomato salsa. 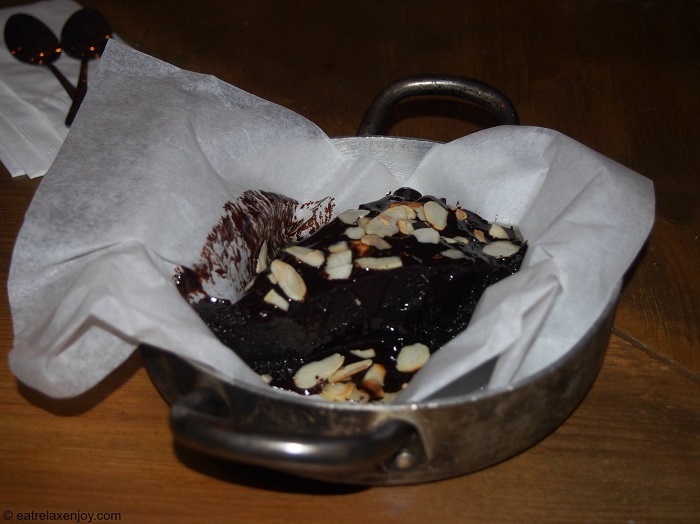 Considering the pricing of this dish – it is a must have! Halloumi a la Romana – Grilled halloumi cheese served on a bed of rocket and artichoke a la Romana topped with tomato confit, scraps of toasted bread and Mediterranean Chimichurri (48 NIS). 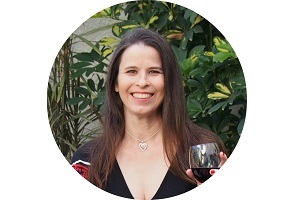 This dish is fantastic – I enjoyed every bite! Fried small fish (Meagre) – on the grill with Skordalia (garlic and potato spread) with ‘al dente’ mangold, asparagus and fresh green beans (96 NIS. 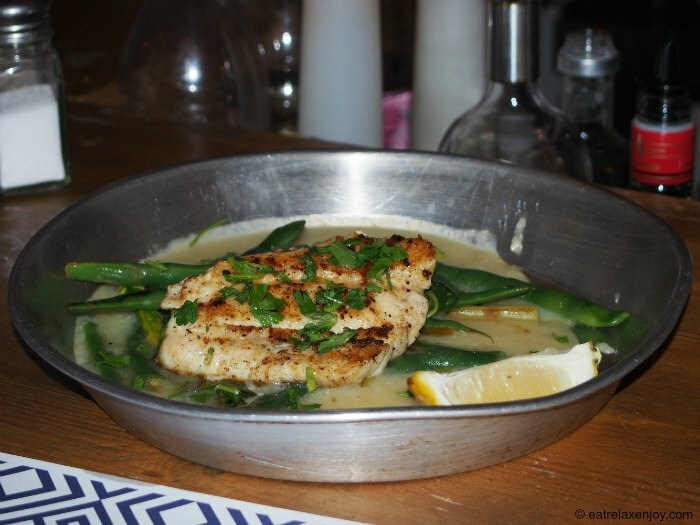 The fish was soft and well-seasoned and the Skordalia had a little citric flavor that fits well with the fish. I also kept some of the Tzatziki and ate it with the fish - this was excellent! 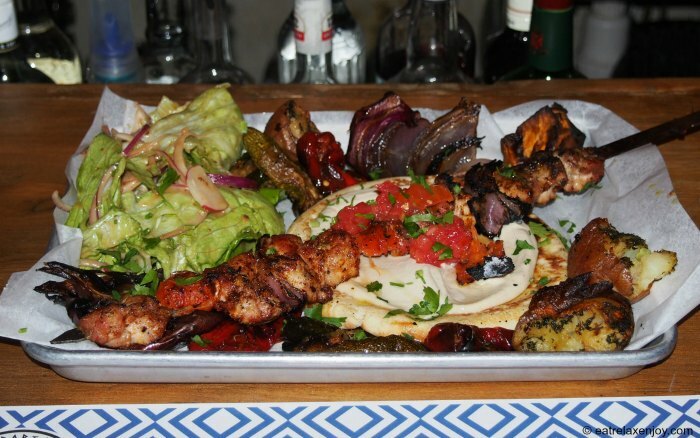 Chicken Souvlaki – chicken skewers, grilled the Saloniki way, served on a Greek pita with tomato salsa and Tahini or Tzatziki, accompanied by grilled vegetables and fried potato (62 NIS). A huge stainless steel tray loaded with food and vegetables from every color! The chicken was perfectly seasoned and gently scorched on the grill, and the Tahini was homemade and very tasty. An excellent plate! For dessert we took chocolate cake, a simple, no thrills chocolate cake with chocolate Ganache and almond flakes that was very good. 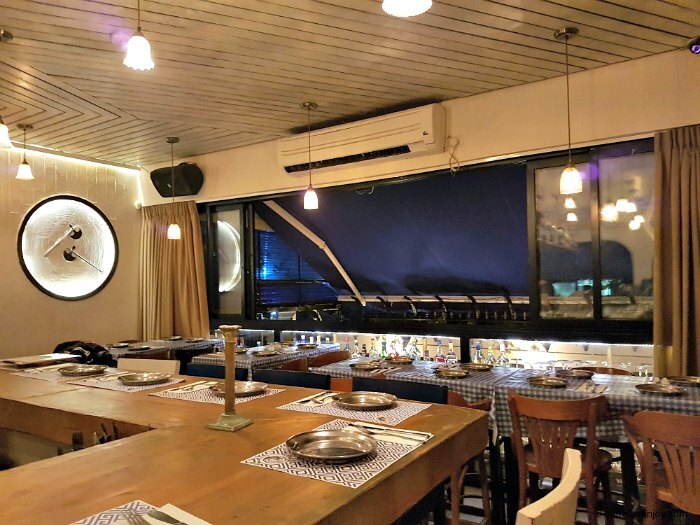 In summary, Sparta is a great place for a fun evening, ghe food at Sparta is yummy, served generously, with interesting Greek touch and flavor that made each plate a party. 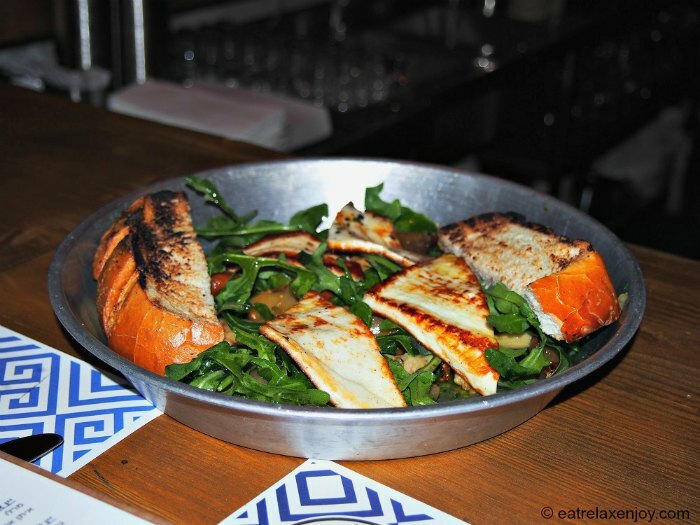 Don’t miss the Dakos and Haloumi a la Romana!